You can't miss the Arts Centre. It's the building beneath the white spire, next to the National Gallery of Victoria (NGV International) a little way along St Kilda Road from Flinders Street Railway Station and Federation Square heading out of the city centre. It's a very unusual building. 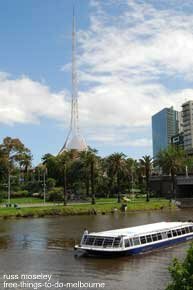 The wavy shape at the bottom of the spire is designed to reflect a ballet dancer's tutu. ........The booklets you can pick up in the Centre seem to have more details on free events than the website does, so if you're in the area pop in and pick them up. .........The exhibition I saw before that was about Australian women rock and roll singers which was also very good. If you just wander around inside you'll find a lot of interesting things to look at. 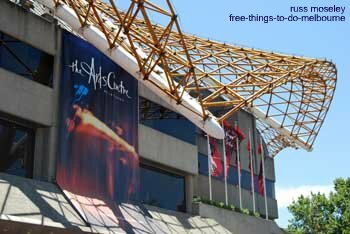 They have display cases of things like costumes, aboriginal art in the Playhouse foyer and art exhibits in the Icon Gallery. These art exhibits change periodically, chosen from the Centre's extensive art collections. Check out the map below to see where The Art Centre is. The fantastic Sidney Myer Music Bowl is also part of the Centre. 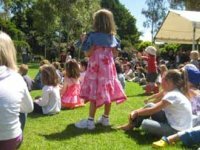 Check out this page as they have occasional free concerts here and it's a great place for a family day out with a picnic.